Indonesian Special Forces look for victims of the Mount Merapi eruption in the devastated village of Glagaharjo. Jakarta, Indonesia (CNN) -- The death toll from recent eruptions of Indonesia's Mount Merapi volcano has climbed to 273, government officials said Wednesday. The toll keeps rising as rescuers search for victims of the volcano, which started its recent eruptions on October 26. The government's volcano alert level remains at its highest level, though officials said last week that the worst might be over. The recent eruptions displaced nearly 400,000 people, according to the Disaster Management Agency. On Wednesday, 300,957 people remained in temporary shelters. Merapi, which looms on the horizon north of the major city of Yogyakarta, is on the island of Java. 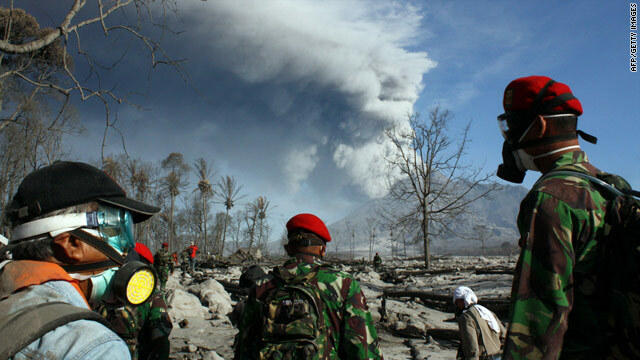 President Susilo Bambang Yudhoyono has called the volcanic eruptions a crisis situation. He and several ministers have visited the area and taken part in relief efforts. The volcano has a summit elevation of almost 3,000 meters (10,000 feet). It is one of Indonesia's most active volcanoes and lies in one of the world's most densely populated areas. Many people raise crops and livestock in its shadow. Yudhoyono has announced that residents will receive compensation for livelihoods and animals lost to the eruptions. The government will buy endangered cows on the volcano, the president said. Many of those who live on its slopes risked their lives by staying or returning to feed their cows during lulls in the volcanic activity. About 1,300 people died when the volcano erupted in 1930. CNN's Andy Saputra and Kathy Quiano contributed to this report.